Wilbert Paige Memorial IM tourney set for mid-July! 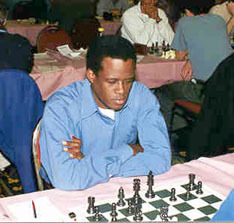 Dr. Jones Murphy, a native of Dominica, is sponsoring a Category III-IV IM norm tournament and it will be in honor of the late Philadelphia Master, Wilbert Paige. Mr. Murphy was the principal sponsor of the Murphy-ACF (GM norm) Internationals in 1994. The Wilbert Paige Memorial International will be held in New York in the middle of July. Participating IMs will be offered reasonable appearance fees. Lodging arrangements will be made available for participants traveling from Africa, or the Caribbean. It is requested that African and Caribbean players contact the Executive Administrator, Jerome Bibuld, who is acting on behalf of Mr. Murphy. Mr. Bibuld may be reached by email at chessphoto@aol.com, by telephone at (914) 939-5023, or by "snailmail" at 377 Westchester Avenue, Apt. 5M, Port Chester, NY 10573-3640, USA.